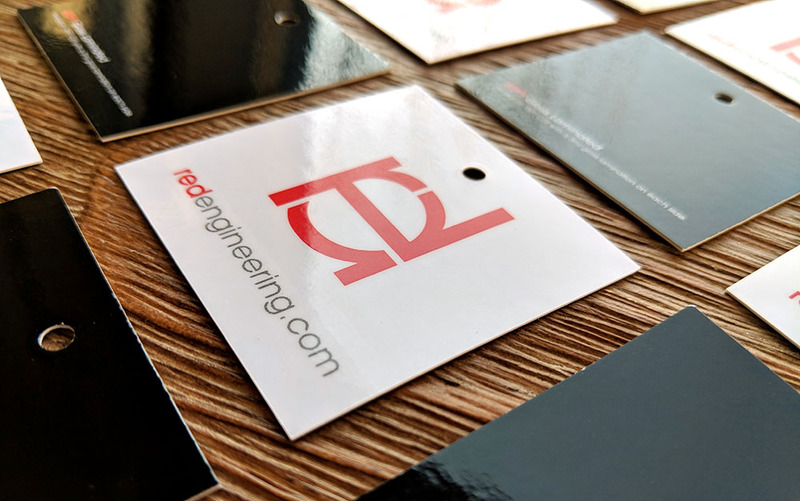 Custom hang tags are the perfect way to showcase your company brand. They serve as an opportunity for a customer to remember your brand. Read on to learn more uses and why your company needs them, and a product guide to walk you through available sizes and finishes. They are exactly what they sound like: a small tag that hangs from an item with info printed on one or both sides. They’re the tags that dangle from new clothing and tell you how much it costs and brand info. Sizes vary, but a square or rectangle is the most common. 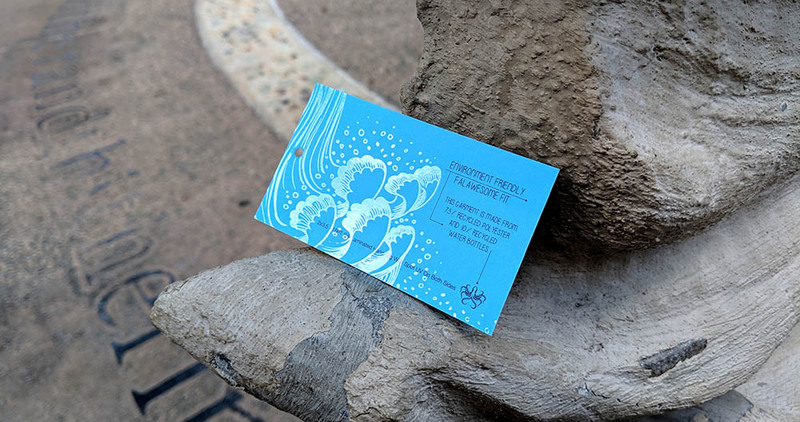 While clothing hang tags are common, there are other ways to use them for business or personal reasons including custom jewelry tags, product hang tags and more. They aren’t just for clothes, jewelry, and sunglasses. Make your brand memorable by attaching a product tag to anything you give or sell to a client. Here are the ways you can use them to elevate your brand. The most popular use is for clothing. These are the calling cards of most retail brands, and often contain the same information as business cards. Since these get thrown away shortly after purchase, invest in a special finish or technique to get attention. Any item sold online or in a brick and mortar business can benefit from using them. As with hang tags for clothing, investing in a non-standard size and/or special finish is a great way to get attention since tags get thrown away before use. They are available on any retail item, from jewelry to sunglasses to gift baskets. Get creative. Even if your item typically doesn’t include a tag, add one to grab a customer’s attention. That one small detail may steer them away from your competition. Throwing a special party or fundraiser? 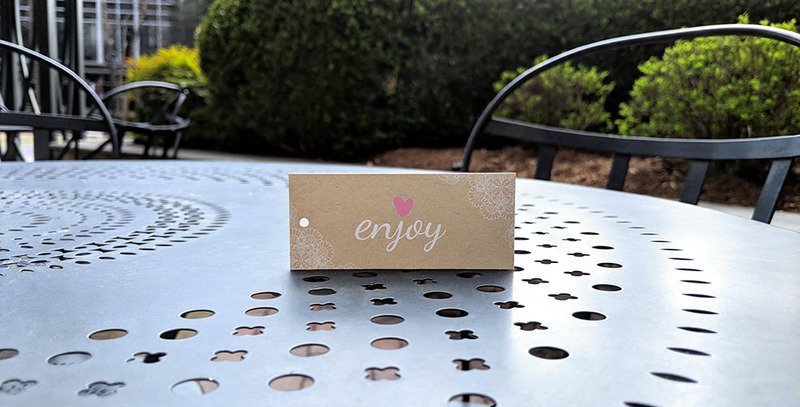 Add a hang tag to party favors to mark the occasion so everyone can remember how much fun they had. 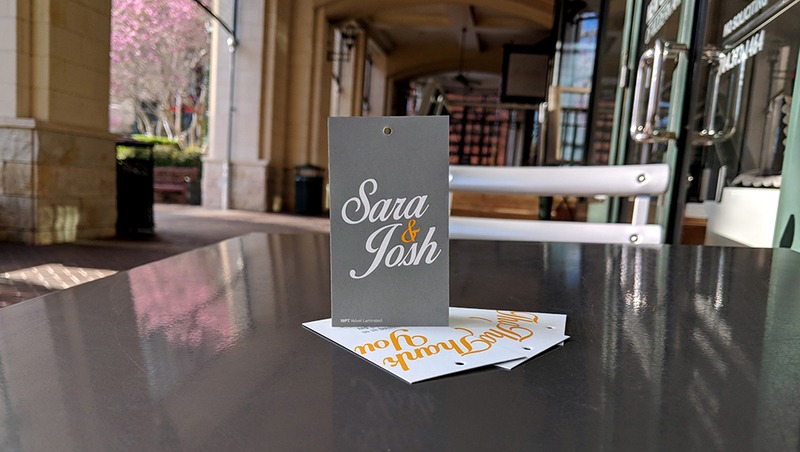 Custom hang tags are a great way to personalize wedding favors, too. If your business gives lots of gifts, personalized hang tags add another dimension to your brand while showing how much you care. Common industries for this include hospitality and real estate. The information you put on them depends on the purpose. More utilitarian tags will often include UPC codes and prices, but some tags are as creative as the items they’re attached to. Special finishes like Spot UV and inline foil grab attention. Ready to print your them? The following product guide walks you through the available sizes, paper stocks and finishes to help you get started. The size depends on two things: how big the item is and how much info you need to give your customers. Bigger isn’t always better, but consider your item’s shelf/rack placement and how visible the tag will be. We’ve already mentioned that the best way for people to notice your hang tag is using special stocks and finishes. Here’s what we currently offer in stocks and special finishes. If you’re looking for extra protection from wear and water with a silky smooth feel, you’ll love silk laminated tags. Printed on 16PT C2S stock with a 1.5 mil silk lamination added to each side, making the total thickness 19PT. If you’re looking for the luxury feel and protection of silk with details that pop, adding Spot UV gloss to elements of your tag will make it stand out among the masses. Add some extra sparkle with stamped foil. Silk lamination provides the extra protection and smooth feel, while stamped foil gives it that extra shine that catches attention. Choose from one foil color on one or both sides. Foil colors available: soft pink, hot pink, silver, gold, red, blue, black, copper, and green. For a shiny front with the ability to write on the back, 18PT C1S provide a sturdy tag that’s glossy on the front and uncoated on the back. For a basic utilitarian tag, 14PT Uncoated is the way to go. Easy to write on. Works great for prices and barcodes. 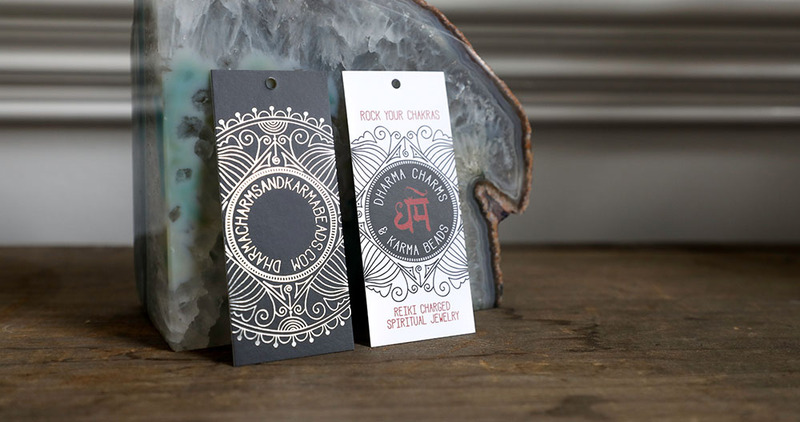 If you’re looking for protection without the glare of gloss, check out Matte hang tag. Printed on 14 PT or 16PT C2S stock with a dull/matte finish. Matte finish provides extra protection without the harsh glare that often occurs on glossy tags. Spot UV is an affordable option to make your design pop. Printed on 16PT C2S, UV coating is applied to areas you specify, creating a shine. Add it to your logo to make it stand out, or apply it in patterns to large areas of solid color to turn your product or gift tag into a conversation starter. Velvet laminated feel as good as they look. Our 19PT velvet laminated hang tags provide a velvety, smooth and rich texture. For a coated tag on a budget, our glossy UV coated tags are printed on a 16PT C2S stock and flooded with a coating on the front only. Great for protecting your front design on a budget. Unlike stamped foil, where the color comes from the foil itself, inline foil uses ink to tint foil applied before printing. This creates seemingly unlimited metallic color combinations that add sparkle to your design. Our 22PT kraft paper stock is made from 30% recycled materials and has visible, subtle flecks which give them a natural feel and organic appearance. Definitely the stock of choice among hipsters and the crafty. White ink printing available. Colors may appear different on this stock; white base coat printing-recommended. Use pearl metallic stock create just the right amount of shimmer. The result is a shimmery, slightly metallic print that gets noticed. These are great for wedding favors and events. Our 14PT natural offers a light, natural and cream color with a smooth natural surface making them great for writing on. This paper stock is eco-friendly as they are made from 30% recycled materials. For an extra sturdy option, check out the thickest one available. The 22PT gloss laminated starts with a 16PT C2S stock, and then an extra thick 3 mil lamination is applied to both sides. This creates the sturdiest one out there, with extra resistance to chipping and wear. Want some assistance getting started? Our support team is happy to help you pick the best option for your brand.